This is good Hemingway. It has some of the tenderness of A Farewell to Arms and some of its amazing power to make one feel inside the picture of a nation at war, of the people experiencing war shorn of its glamor, of the emotions that the effects of war -- rather than war itself -- arouse. But in style and tempo and impact, there is greater resemblance to The Sun Also Rises. Implicit in the characters and the story is the whole tragic lesson of Spain's Civil War, proving ground for today's holocaust, and carrying in its small compass, the contradictions, the human frailties, the heroism and idealism and shortcomings. In retrospect the thread of the story itself is slight. Three days, during which time a young American, a professor who has taken his Sabbatical year from the University of Montana to play his part in the struggle for Loyalist Spain and democracy. He is sent to a guerilla camp of partisans within the Fascist lines to blow up a strategic bridge. His is a complex problem in humanity, a group of undisciplined, unorganized natives, emotionally geared to go their own way, while he has a job that demands unreasoning, unwavering obedience. He falls in love with a lovely refugee girl, escaping the terrors of a fascist imprisonment, and their romance is sharply etched against a gruesome background. 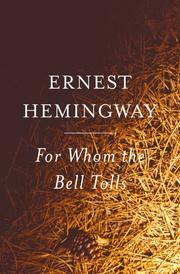 It is a searing book; Hemingway has done more to dramatize the Spanish War than any amount of abstract declamation. Yet he has done it through revealing the pettinesses, the indignities, the jealousies, the cruelties on both sides, never glorifying simply presenting starkly the belief in the principles for which these people fought a hopeless war, to give the rest of the world an interval to prepare. There is something of the implacable logic of Verdun in the telling. It's not a book for the thin-skinned; it has more than its fill of obscenities and the style is clipped and almost too elliptical for clarity at times. But it is a book that repays one for bleak moments of unpleasantness.